The plumping of your home is out of sight and out of mind for a reason, but when it is in need of sewer line repairs, you need to know the signs and act fast. Be mindful of these common signs of damage and then consider trenchless plumbing for a more permanent fix. The cost to repair a sewer main can range anywhere from $1,050 to $4,013, with an average of $2,523. The cost depends entirely upon the kind of damage, so before it gets any worse watch out for these warning signs. Wet spots on the lawn. A major leak in your sewer line can make your lawn always wet even when it has not rained. In your lawn you should also watch out for standing water, pooling of wastewater, or patches of grass that are noticeably lusher or greener. Foul odors. The sink drains in your kitchen or bathroom may give off the smell of waste indicating a backup in the pipes. The lingering smell of gas in or around your home may be the result of a sewer gas leak. A sudden rise in your water bill. If your water bill is significantly more than it has been in previous months, you may need to look into trenchless plumbing instead. The higher bill could be the result of major leakage and wastage of water. Inconsistent water levels and pressure. Your toilet bowls may be overflowing or be overly empty when there is a sewer line issue. Lowering water pressure in your sink or shower and slow draining from all water sources in your home can indicate the same. Cracks in the foundation. Look for cracks in the foundation slab, foundation settlement, or sinkholes that could indicate instability in your sewer line system. Gurgling Noises. Loud, unusual gurgling noises, while you are using the shower or doing the dishes, could mean an interrupted flow of water through the pipes. Persistent pest problems. If you’re fighting a rodent or insect infestation that traditional pest control measures are not solving, it may be because of a burst sewage line. Many homeowners will seek quick, cost-effective solutions like simple patching to fix their sewer pipe problems. These solutions are often short-term fixes and can lead to bigger, more expensive issues in the future. Instead, it is more effective to invest in a more permanent solution such as trenchless plumbing, which is far more durable than traditional sewer lines and will save you a considerable amount of money in the long run. While your septic system is designed to release sewer water into your yard in a slow and non-harmful way, if enough water is being released to create puddles, it’s time to get the system checked. Standing water can signal issues with a sewage tank, pipes, or the drain field. While not always a sign of a serious malfunction, standing water should still be addressed. A patch of greener grass near the septic tank may also indicate a leak or sewer system failure. Not only does the extra moisture from the leak hydrate your yard, but if the grass is significantly greener and spongy, human waste could be fertilizing it. 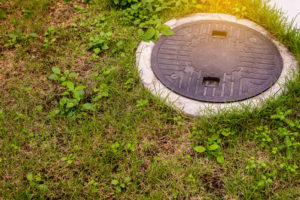 If you notice greener, wetter grass paired with a foul smell in the yard, you could have a whole host of issues, from a clogged drain field to a burst sewage line. If one sink or drain in your home backs up from time to time, it is probably just a small clog. However, if you notice that every drain in your home –toilets, sinks, showers, washing machines– are slow to drain and frequently overfill, you could have a very serious septic problem on your hands. If you’re experiencing any of the problems mentioned above, or if you just want to be safe, consider having a specialist come to your property to conduct a sewer line inspection. The inspector might test your well water, look for sewer gas leaks, check parts of your septic system, and figure out when your septic tank was last pumped. They may also recommend other checks and solutions, like smoke testing, parts replacement, or no dig pipe repairs. There are a whole host of issues that could arise with your sewer system. While some repairs might be fairly quick and painless, there are other problems that could take many days and many dollars to overcome. 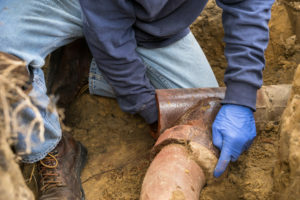 Be sure to do your research– thanks to innovative sealant technologies, there are no dig pipe repair options that can prevent your yard from being excavated. No dig pipe repair might also save you time and money. Do extensive research and consult professionals if needed. While sewer problems can be both frightening and disgusting, knowing the signs can help prevent catastrophe. Stay informed, and don’t be afraid to contact the professionals for help, so that your yard and your family can stay clean and healthy.